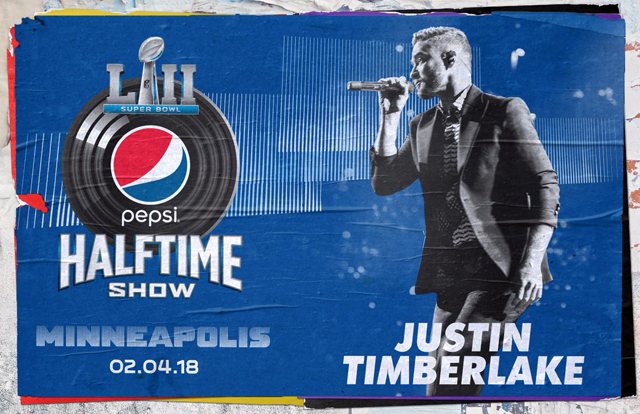 Justin Timberlake has been confirmed as the halftime entertainment for Super Bowl LII in Minneapolis, Minnesota. Super Bowl 52 will be played on February 4, 2018 at U.S. Bank Stadium in Minneapolis. Timberlake will be making his first appearance at a Super Bowl halftime show since the infamous “Nipplegate” performance with Janet Jackson at Super Bowl XXXVIII in 2004. Last year’s Pepsi halftime show at Super Bowl LI was headlined by Lady Gaga. The Super Bowl LII halftime show will again be produced by Ricky Kirshner and directed by Hamish Hamilton. The British director as been in charge of multiple Super Bowl halftime shows as well as the Academy Awards, MTV Music Awards, Victoria’s Secret Fashion Show and 2012 London Olympic Opening and Closing Ceremonies. Kirshner has produced multiple Super Bowl halftime shows dating back to 2007. 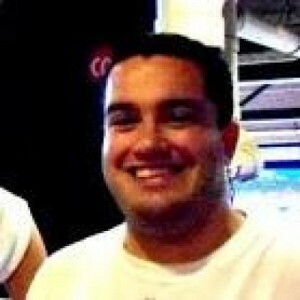 He has also produced the Tony Awards each year since 2000 among other events. Reports about Timberlake’s performance began to leak out almost a month ago and the NFL officially confirmed the news in a tweet on Sunday. They have not announced if any other artists will be performing with the former NSYNC singer. Timberlake also tweeted out a short video where he made the announcement with help from an ecstatic Jimmy Fallon. At the end of the song, the script called for Timberlake to rip off part of Jackson’s costume, exposing her red lace bra. Instead, more of the outfit came off than intended, exposing Jackson’s right breast to the audience for a brief moment. The “wardrobe malfunction” led to the Federal Communications Commission fining CBS $550,000 fo indecency. A federal appeals court later overturned the fine in 2011. Watch the video of the full Super Bowl XXVIIII halftime show in 2004 below. The performance and the “Nipplegate” controversy led to changes in future Super Bowl halftime performances and the creation of YouTube. Some Janet Jackson fans took to social media to voice their displeasure at the news. Many feel Timberlake’s actions in 2004 have had a negative effect on Jackson’s career in the years since. 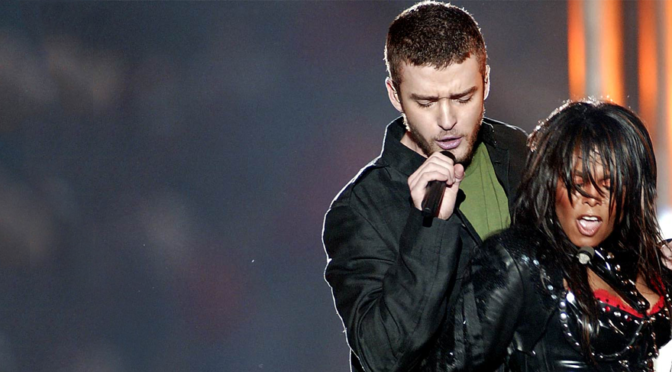 Timberlake also performed during the Super Bowl halftime show in 2001, otherwise known as maybe the best Super Bowl halftime show ever. At that time, he was still a member of the band NSYNC and took the stage with JC Chasez, Chris Kirkpatrick, Joey Fatone and Lance Bass. Britney Spears, Aerosmith, Mary J. Blige and Nelly also performed. The performance opened with a pre-recorded video that saw the performers getting a pre-performance pep talk from Ben Stiller. Watch the full performance from Super Bowl XXV halftime show below. Check out more of our favorite Super Bowl halftime performances through the years in this post we did a few years ago. Want to get an early start on finding the best place in St. Louis to watch the Super Bowl? Here were the Best Places To Watch The Super Bowl Around St. Louis In 2017.